John Goodman says he doesn't want to add "more trouble" to his TV wife's mess. Like many good husbands, John Goodman knows when not to air his wife's dirty laundry in public. The veteran actor and Roseanne Barr's TV husband broke his silence on Barr's racist Twitter fiasco, gingerly broaching the subject that led to his hit ABC TV show getting canceled on Tuesday. "It's not that I disrespect you guys. I would rather say nothing than to cause more trouble," Goodman, 65, politely told an "Entertainment Tonight" videographer who caught up with him Wednesday. (Adam Rose/ABC/AP) Roseanne Barr, left, and John Goodman appear in a scene from the reboot of "Roseanne." 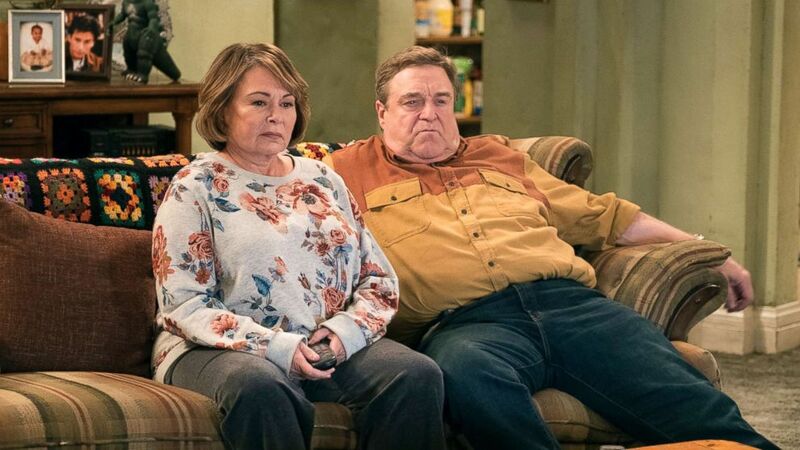 Goodman, 65, plays Dan Conner, the working-class dad on "Roseanne," a character he first made famous in 1988 and revisited earlier this year when the show was rebooted by ABC. Barr came under fire shortly after she posted an offensive tweet early Tuesday morning targeting Valerie Jarrett, a former top adviser in the administration of President Barack Obama. In the tweet, Barr wrote that Jarrett, an African-American born in Iran, was the product of the Muslim Brotherhood and "Planet of the Apes." 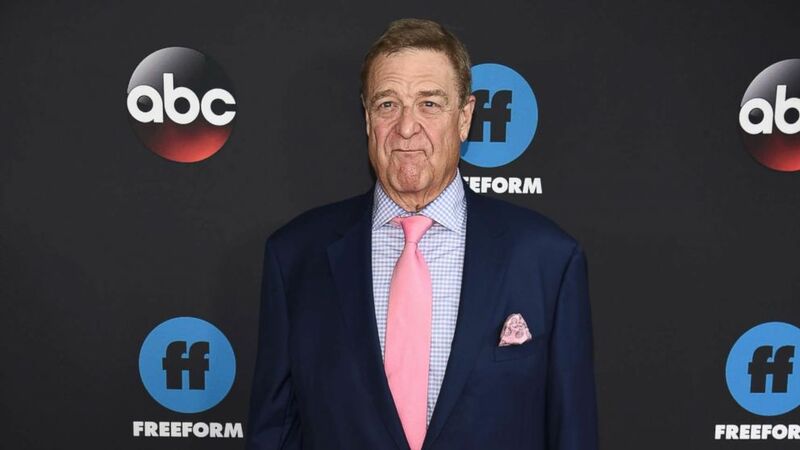 (Dimitrios Kambouris/Getty Images) John Goodman attends the 2018 Disney, ABC, Freeform Upfront at Tavern On The Green, May 15, 2018, in New York City. She later apologized for the "stupid tweet" but it was too late. Channing Dungey, the president of ABC Entertainment, issued a statement Tuesday calling Barr's tweet "abhorrent, repugnant" and announced the show "Roseanne" -- which the network had picked up for a second season -- was being canceled. "I don't know anything about it," Goodman said when asked what his response was to the fallout. "I don't read it." When asked how he was doing, Goodman said, "Everything's fine." Goodman also said he was not expecting to receive an Emmy for his reprisal of the Dan Conner role. "I wasn't gonna get an Emmy anyway," he said when asked if he thought the Barr controversy would cost him the award. "I've been up there 12 times already and if I don't get one by now, I'm not gonna get one." Other members of the "Roseanne" cast haven't been as circumspect as Goodman. Actress Sara Gilbert, who played Barr's daughter on the show, condemned Barr's tweet. "Roseanne's recent comments about Valerie Jarrett, and so much more, are abhorrent and do not reflect the beliefs of our cast and crew or anyone associated with our show," she tweeted. Michael Fishman, who has played son D.J. Conner on the series, also took to Twitter, writing, "While I am going to miss being part of the ABC family, I believe that to sit back or remain silent in an attempt to distance myself from the actions/statements of others would unintentionally endorse or placate those statements which I find truly offensive. In this moment it is important to be clear. We must stand-up against; bias, hatred, bigotry and ignorance to make society a better place for all." 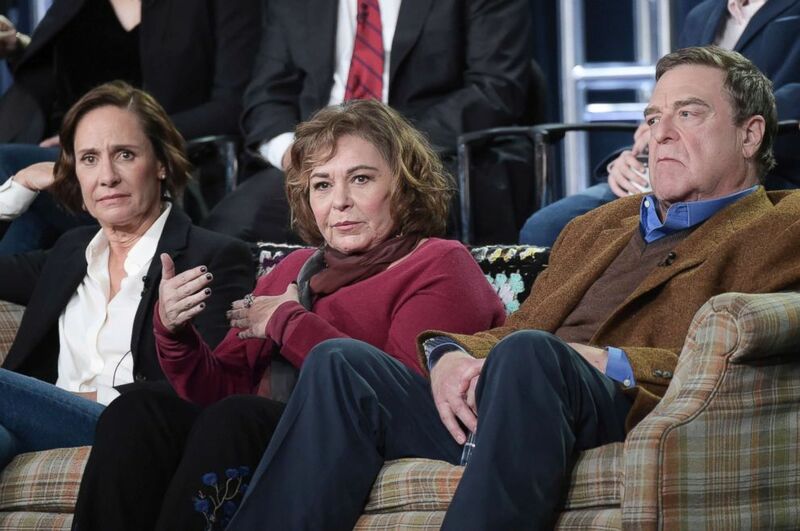 (Richard Shotwell/Invision/AP) Laurie Metcalf, left, Roseanne Barr and John Goodman participate in the "Roseanne" panel during the Disney/ABC Television Critics Association Winter Press Tour in Pasadena, Calif., Jan. 8, 2018. Responding to Fishman's statement on Wednesday, Barr tweeted, "I created the platform for that inclusivity and you know it. ME. You throw me under the bus. Nice!" Barr, however, was much nicer to Goodman and actress Laurie Metcalf, who played her sister on the show. (Vera Anderson/WireImage/Getty Images) Roseanne Barr appears at a press conference at the Four Seasons Hotel on March 23, 2018 in Beverly Hills, Calif.
"I just wish ABC had not thrown two of the greatest actors in the world out with me-Laurie and John," Barr tweeted Wednesday night. "I'm so sick over this-they will never have better character actors on their network."